At some point today you will have to influence or persuade someone - perhaps ask a colleague a favour, negotiate with a contractor or get your spouse to put out the recycling. In The small BIG, three heavyweights from the world of persuasion science and practice - Steve Martin, Noah Goldstein and Robert Cialdini - describe how, in today's information-overloaded world, it is now the smallest changes that lead to the biggest differences in results. 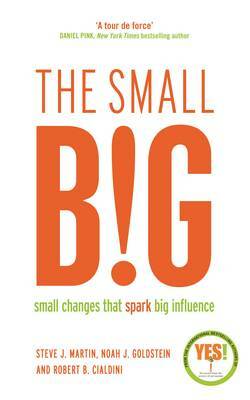 Offering deceptively simple suggestions and explaining the extensive scientific research behind them, the small BIG presents over fifty small changes - from the little adjustments that make meetings more effective to the costless alteration to correspondence that saved a government millions. the small BIG is full of surprising, powerful - and above all, tiny - changes that could mean the difference between failure and success.